eos (HarperCollins), 2005. 166 pages. I’ve definitely become a fan of Hilari Bell’s writing. Like The Prophecy, The Wizard Test is a fantasy for middle grade readers that takes a classic idea and digs deeper. Dayven does not want to pass the Wizard Test. He does not want to have the powers of wizards and be taken as an apprentice. Everyone knows that wizards can’t be trusted. His grandmother, who may have passed her wizard talents on to him, was a traitor to her people. No, Dayven wants to be a Guardian like his father. But what if the Guardians ask him to go ahead and apprentice to the wizards? After all, they need someone to find out what the wizards are up to. The only trouble is that Dayven finds things a little more complicated than he had been led to believe. This is another excellent story. I didn’t find myself as absorbed in it as I was in The Prophecy. My personal theory is that Dayven didn’t pass the Not Whining Test. Where Perryndon of The Prophecy accepted difficult circumstances with pluck, Dayven grumbles and complains. However, this book was written earlier than The Prophecy, so I think it goes to show that Hilari Bell went from very good writing on to greatness. I’m looking forward to reading more of her work. Image Books (Doubleday), New York, 1992. 139 pages. This book is not quite like any other devotional book I have read. 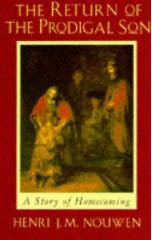 The focus and structure of the book involves the author’s encounter with a painting: Rembrandt’s The Return of the Prodigal Son. This painting, of course, presents a story from the Bible, in a way that gives the characters new life. He tells about his own encounters with the painting and what it meant in his life. He writes about what the painting must have meant in Rembrandt’s life. And he talks about how we have the opportunity to stand in the place of each character in the painting. All that I have lived since my first encounter with the Rembrandt poster has not only given me the inspiration to write this book, but also suggested its structure. I will first reflect upon the younger son, then upon the elder son, and ultimately upon the father. For, indeed, I am the younger son; I am the elder son; and I am on my way to becoming the father. And for you who will make this spiritual journey with me, I hope and pray that you too will discover within yourselves not only the lost children of God, but also the compassionate mother and father that is God. The result is a beautiful and inspiring book with thoughts that will stay with you. The Empty Kingdom is a sequel to The Lion Hunter, which follows The Sunbird. In The Empty Kingdom, Telemakos, grandson of Artos of Britain, begins to grow into his heritage. He is still living in Himyar, still knowing the state secrets he discovered in the last book. How can he warn the emperor of Aksum? And if he is caught, what terrible things would happen to him? The Empty Kingdom includes more intrigue, more danger, and more exploits by Telemakos’ feisty little sister Athena. The books Elizabeth Wein writes began with The Winter Prince, a story of King Arthur’s sons. The rest are set in old Ethiopia and south Arabia, where one of those sons, and his sister, ended up. Telemakos, the hero of these last three books, has the light hair of his British father but the dark skin of his Aksumite mother. He has an amazing talent for learning secrets, and seems to be drawn to a fateful destiny. Elizabeth Wein’s characters have amazing depth. At the end of the book, I caught myself wondering who was good and who was bad. How like life that is. I hope there will be more stories of Telemakos and his sister Athena, as well as the lands of Aksum, Himyar, and post-Arthurian Britain. Schwartz & Wade Books, New York, 2008. 172 pages. 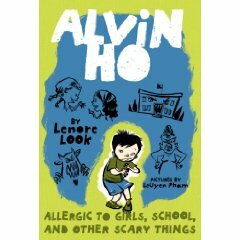 Alvin Ho: Allergic to Girls, School, and Other Scary Things, reminded me of Diary of a Wimpy Kid, only for younger kids. It has similar cartoon drawings generously illustrating the story, and a similar attitude toward school. Alvin tells us that before he went to school, he was a superhero. “I was Firecracker Man! I ran around our house, full speed ahead, screaming at the top of my lungs while beating on a garbage can lid. I was as noisy as a firecracker on Chinese New Year! . . .
“But now I am Firecracker Man only on weekends and holidays. There is just no time for it. “Being a superhero is hard work. You have to save the world. But going to school is even harder. You have to save yourself. Most days I can hardly even make it to the school bus. And when I arrive at school, I can’t think. I can’t read. I can’t smile. I can’t sing. I can’t scream. It turns out that Alvin has never said one word at school. He can talk anywhere else, even on the school bus. But at school, his voice simply doesn’t work. Not talking at school makes it hard to make friends. It makes it hard to avoid annoying girls who want to be your desk buddy. It makes it hard to join in a game of Minutemen and Redcoats. It makes it hard to explain to a substitute teacher why you aren’t responding to her questions. This book is a lot of fun, with a nice set of school-related scrapes, and Alvin learning to confront his fears. I did think the chicken pox adventure, where the whole class gets chicken pox after paying to visit the first kid who caught it, was funny, but sadly out of date. My 14-year-old son was required to get a chicken pox vaccination before he went to school, and I think that’s pretty standard now. So today’s children, poor things, will never know the joys of two weeks off of school along with the fun of showing off ones spots. There are some great quirky characters. Alvin’s Dad likes to use Shakespearean imprecations when he’s angry. The annoying girl Flea wears an eyepatch. Alvin’s sister loves to dig holes. And Alvin himself is a big collection of entertaining quirks. Alvin Ho is longer than a beginning chapter book, but makes fun, non-threatening reading with lots of pictures for a kid ready to laugh at the trials and tribulations of facing scary things like school and bullies and girls. Little, Brown, and Company, 2008. 619 pages. I thoroughly enjoyed The Host, liking it even better than Stephenie Meyer’s more famous Twilight series. This one was written for adults, so that may be some of why I liked it. But I also thought it was well-written. She didn’t have the whole traditional spectrum of vampire stories to contend with. Of course, she did have the noble tradition of body-snatcher stories up against her! But I haven’t read or watched very many of those at all. Her description of what it would be like if mind-stealing aliens tried to take over earth seemed right. Of course! That is what would happen. Wanderer is an alien who has lived on seven different planets. But when she is put into the body of a human on earth, it doesn’t go as smoothly as with any other host. The host begins by hiding things from Wanderer. Names of people she loves, and where they might be hiding. She doesn’t want Wanderer to tell a Seeker. However, this host, named Melanie, should not still be there at all. Melanie’s voice gets stronger. Wanderer is ready to give up, to find a new host and let a Seeker be put into Melanie’s body. But somehow, she can’t bring herself to give up Jared and Jamie. Instead, she goes to find them. Can Wanderer, nicknamed Wanda, keep from betraying the humans she now loves as much as Melanie does? Will those humans even give her a chance, since they think of her as the monstrous mind-thief alien who stole Melanie’s body? I found myself believing that indeed humans would not just disappear if powerful aliens invaded our planet. Indeed, the aliens might find more than they bargained for. The Host is a wonderful exploration of life and love and what it means to be human. I knew the human exaggeration for sorrow — a broken heart. Melanie remembered speaking the phrase herself. But I’d always thought of it as hyperbole, a traditional description for something that had no real physiological link, like a green thumb. So I wasn’t expecting the pain in my chest. The nausea, yes, the swelling in my throat, yes, and, yes, the tears burning in my eyes. But what was the ripping sensation just under my rib cage? It made no logical sense. G. P. Putnam’s Sons, 2008. 263 pages. 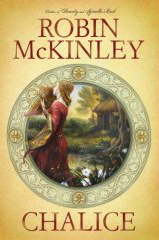 Chalice is a new Robin McKinley book in the tradition of Hero and the Crown and Beauty. As always, Robin McKinley is a consummate world-weaver. The magic in the world of Chalice isn’t quite like any fantasy world I’ve read about before, but is presented smoothly and beautifully, through story rather than explanation. In this land, demesnes are held by a Circle, composed of the Master, the Chalice, the Grand Seneschal, and nine others. Willowlands lost both Master and Chalice in one disaster, and Mirasol, chosen as the new Chalice is woefully ill-prepared, but perhaps more prepared than the new Master. Their new Master was coming home: the Master thought lost or irrecoverable. The Master who, as younger brother of the previous Master, had been sent off to the priests of Fire, to get rid of him…. The priests of Fire said they would see what they could do, but they promised nothing. The younger brother of the old Master had just crossed into the third level, and by the third level Elemental priests can no longer live among ordinary humans. But six weeks ago the Grand Seneschal had received another message from the priests of Fire: that the Master of Willowlands was coming home. It would not be an easy Mastership, and the priests were not sure it was even posible, but the Master himself felt the responsibility to his demesne, and he was determined to try. Mirasol was a beekeeper long before she was Chalice. She holds her Chalice in honey, the first Chalice to do so, rather than the usual water or wine. Her bees become unusually responsive to her as she learns her role. She hears the earthlines and mends the rifts in the land of the demesne, trying to recover after seven years that the new Master’s older brother abused it. Can Mirasol, inexperienced and unapprenticed, learn what she needs through books? Enough to help the land adjust to a Master who was so far along in the Fire Priesthood that he burns her hand when he brushes against it to take the Welcome Cup? As in some of her other books, the main weakness is that the action is mostly internal. Several important incidents are told through flashbacks, losing some immediacy. Even as the action was reaching a climax, we read, Many years later her memory of the week before the faenorn was that — till the very last night — she had no sleep at all, except in those moments between blink and blink when you are so tired that you fall asleep standing up with your eyes open and wake again by finding yourself staring at the thing in your hands that you had been staring at just a moment ago. That sentence gives away that Mirasol will live through the events at the end of this week and makes the reader feel like she is looking back on the events, rather than currently experiencing them. What’s more, like Aerin of The Hero and the Crown, like Jake of Dragonhaven, most of Mirasol’s work is done alone, and there are many things she must figure out on her own. So instead of scenes with dialogue, these moments end up being long passages telling about Mirasol’s thoughts or solitary actions. Mind you, no one tells someone’s thoughts more lyrically than Robin McKinley! Chalice is truly a wonderful book that catches you up into another world. I would love for her to write a sequel. And I will never look at bees or honey quite the same way again. Arthur A. Levine Books (Scholastic), New York, 2007. 32 pages. Oh, how I wish this book was around when my own son Timothy was the same size as Timothy Smallbeast! 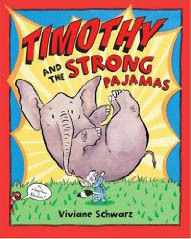 Timothy tries to make himself strong, but to no avail — until his favorite pajamas fall apart, and his mother fixes them. She fixed them so well, they were now Super Strong Pajamas, with Patches of Power and Buttons of Braveness. Fortunately, it’s the weekend, and Timothy is allowed to wear his pajamas all day, ready and equipped to come to the aid of all who need him. When Timothy himself needs aid, there’s a wonderfully satisfying solution, springing from the seeds of the good deeds Timothy has sown. You are currently browsing the Sonderbooks blog archives for September, 2008.